With thanks to the Crawford Fund, Australian scientists from CSIRO Land and Water (CSIRO) and the University of Tasmania (UTAS) travelled to Vietnam recently. Dr Chris Harwood (CSIRO), Adj. 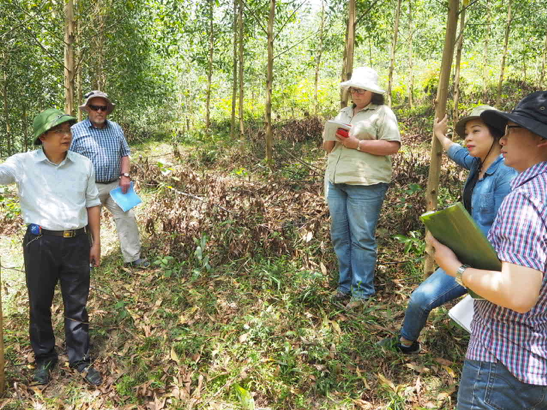 Prof Rod Griffin and Ms Jane Harbard (UTAS) conducted a week-long mentoring program that reviewed and updated Vietnam’s Acacia tree breeding strategies through field and laboratory visits and workshops. The training was held at the Institute of Forest Tree Improvement and Biotechnology (IFTIB) at the Vietnamese Academy of Forest Sciences (VAFS) and is part of ongoing mentoring with IFTIB-VAFS breeders. Despite progress being made over the last 20 years, major limitations are still challenging Vietnamese commercial Acacia growers. Growers are facing challenges gaining access to additional sources of genetically varied and improved Acacia seed that are pest and disease tolerant. Ongoing mentorship between Australia and Vietnam is supporting scientists to breed hardy Acacia varieties to improve Vietnam’s plantation production. Mr Hoang Minh Chuc, Dr Rod Griffin, Ms Jane Harbard, Dr Nghiem Quynh hi and Dr Do Huu Son inspect a clone trial at Yen The, Bac Giang Province. Dr Harwood, Prof Griffin and Ms Harbard returned to Vietnam recently to continue their mentoring work with the VAFS. The Australian mentors spent five days working with their Vietnamese colleagues inspecting genetic field trials in southern, central and northern Vietnam, then assisted with the development and presentation of the results at a two-day workshop in Hanoi. The focus of the joint inspection was to assess the progress of the Acacia breeding program, looking specifically at the development of tetraploid breeding populations. Growth performance was also assessed along with developing an understanding about the sterility and the reduced fertility of selected Acacia clones. Additionally, the team looked at the development of hybridizing orchards for the production of new hybrid varieties and checked on the progress of the new synthetic hybrid breeding strategy. In the laboratory, Ms Harbard, an expert in flow cytometry, assisted staff responsible for ploidy determination using flow cytometry to upgrade their methods, standards and laboratory performance. The mentor supported workshop was the first time that IFTIB has led a formal strategic review of its Acacia breeding strategies. Attended by 20 IFTIB scientists, with presentations held in Vietnamese and English, the workshop included discussions and presentations about the progress, limitation, threats and the outlook of Vietnamese breeding strategies for pure species, diploid hybrids and polyploid breeding. As well as the use of DNA markers and adoption strategies to improve pest and disease resistance. Other topics covered in the workshop included the development of polyploid Acacia varieties, maintenance of pedigree information, novel synthetic hybrid breeding strategies, methods to enhance breeding for disease tolerance and strategies for commercialisation of the new varieties. Dr Jeremy Brawner, a project leader for The Australian Centre for International Agricultural Research (ACIAR) project, Management strategies for Acacia plantation diseases in Indonesia and Vietnam (FST 2014/058), also presented at the workshop, where he shared his expertise on screening Acacia breeding populations for disease tolerance in Vietnam and the region. ACIAR’s collaboration with Vietnam to support Acacia breeding program spans 25 years. “The visit was of great value as it gave chances for all Vietnamese tree breeders to gather and discuss in depth progress in Acacia breeding with support from Australian friends who have spent more than 20 years to support our breeding programs,” said Dr Nguyen Duc Kien, Director of the IFTIB. 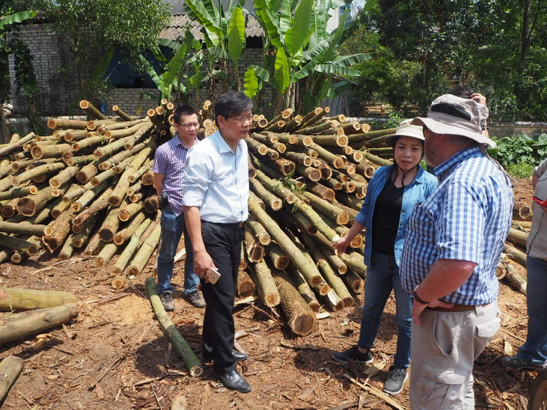 Dr Do Huu Son, Mr Hoang Minh Chuc, Dr Nghiem Quynh Chi and Dr Rod Griffin discuss wood processing at Yen The, Bac Giang Province. “We are all prepared to continue this excellent working relationship with our Vietnamese friends,” said Dr Harwood. The visit renewed professional ties between the Australian scientists, who have previously worked on a series of ACIAR-funded projects, and IFTIB staff. As a result of the workshop, plans have been established for writing several jointly-authored scientific papers during the coming year. “We appreciated the visit by Dr. Harwood, Prof. Griffin, Ms Harbard and Dr. Brawner for their support and great contributions to our breeding program. We hope to continue working with them in the future to help us implement our breeding activities,” said Dr Nguyen Duc Kien, Director of the IFTIB.